We've carefully chosen pure scents specifically conducive to enhance and enrich the meditative experience, whether it's light meditation, or deep states of exploration in alternate realities. We also offer these items as close to wholesale as possible, so as many people as possible can enjoy the rich scents and countless benefits for themselves. With SAME DAY SHIPPING of HIGH QUALITY products made to EXACTING STANDARDS, we guarantee our service is better and our prices are lower than anyone else, period. Incense: What is it and How Do I Use it? Humans are blessed with five basic senses. Of those, scent is, after touch, the most intimate. Most human senses have very complicated nerve processes that send information to the brain. Unlike the others, the sense of smell is "directly wired" to the brain. The left half of your brain controls your right hand, but your left nostril is connected to the left side of your brain. The sense of smell is an ancient trait and incense provides a quick connection to your brain. Memory and smell are heavily intertwined. Certain smells can transport us back in time to a memorable place or event. Incense has many applications in life. Incense is a way to "redecorate" a room in seconds. Although it might take you days to paint a room in order to change how it looks, you can change how it smells by lighting a simple cone of incense. Not to mention that with incense, you can "redecorate" the room every thirty minutes if you so desire. Incense is also a wonderful assistant for meditation. The gentle scents of sandalwood and cinnamon can bring greater depth to your meditation with the wonderful aftereffects of the lingering scent. 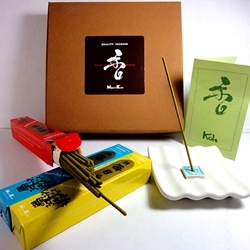 In fact, many types of high-quality (and quite expensive) Japanese incense are an integral part of the meditation habits of people worldwide. This incense may actually create a biochemical reaction, which impacts the meditation experience. As practitioners of ritual magick know, incense can make a tremendous difference to the entire magickal process. Incense is used to cleanse and create sacred space, as an offering both on and off the altar, a way to create a magickal atmosphere, and a way to help the practitioner achieve specific mental states. The effects of incense can have a deep impact on both major rituals and minor magick. Finally, although it is quite mundane, sometimes there is a bad smell that you might want to mask. From litter boxes to cigarette smoke to stale fish, there are things in all our lives that don't smell as good as they could. Lighting up a stick of incense offers an immediate way to modify the scent of any room. It takes work and practice to make truly amazing. Reprinted from "Incense: Crafting & Use of Magickal Scents".